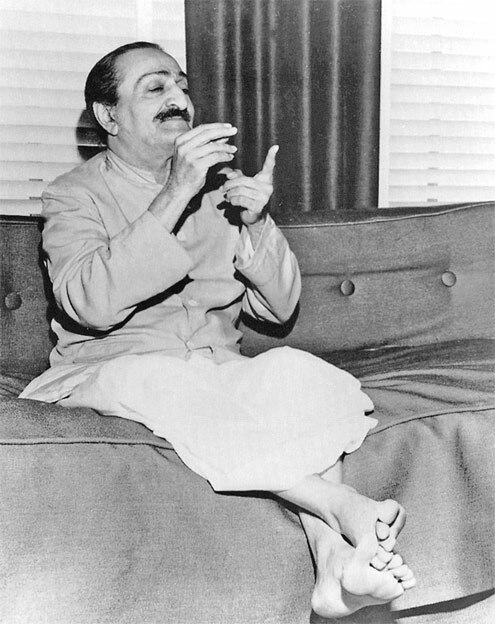 Meher Baba, an Indian spiritual leader who has been observing a rigid self-imposed silence for 31 long years on spiritual grounds, arrived here yesterday for a two-day visit. The Indian, who has followers on all five continents, is on a round-the-world trip to meet the faithful and reiterate his message. Arriving in New York, July 20, he has already visited strongholds of his following on the East Coast. His American disciples are said to number in the thousands. Baba is a short, stocky man with striking features, penetrating eyes, and flowing hair. Placid, smiling and affable, the spiritualist, in exotic Hindu costume, presented yesterday a marked contrast to his Hollywood environment. Meeting the press in his Roosevelt Hotel suite, he answered queries through the medium of an alphabet board: "What message does he have to our world and times?" "Philosophers, atheists and others may affirm or refute the existence of God. But as long as they do not deny their very existence, they continue to testify their belief in God." "God is existence, eternal and infinite. He is everything. The only one aim in the life of man is to attain unity with God."